Hello! Welcome to day 2 of Taylored Expressions January Sneak Peeks! We are releasing 8 new stamp sets, 16 new dies and 2 new cutting plates! All products will be released on Thursday, January 9, @ 7 AM PST. Today we are showing some new products from the Pockets & Pages collection. 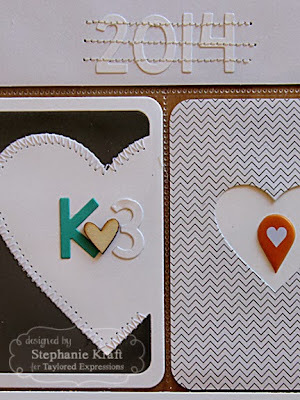 My first project features one of the new 3x4 dies that is perfect for pocket scrapbooking! I used 3x4 - Part of My Heart along with other Taylored Dies to create my Project Life 2014 title page. I'm excited to begin a new year of PL! My goal is to complete pages more quickly, so I am going to streamline my process. I usually spend a lot of time making each pocket "perfect" and add a lot of details and embellishments, but I'm going to try to keep them more simple so I can keep up with documenting our daily lives. I used the die with Choice Snow White and used both the die and negative cut in both of my hearts (far left and far right) in the middle of the page. I also used the Pockets & Pages Essentials - 3x4 dies to create some of the cards in the middle pockets. I also used Heart Stacklets to cut the heart out in the center of the chevron filler card (above) and to cut out the yellow striped heart (below right). I typed up the quote, printed on Choice Snow White cardstock and used P&P - 3x4 Essentials dies to cut the 2 layers for the card on the left. My next project uses one of the new cutting plates. 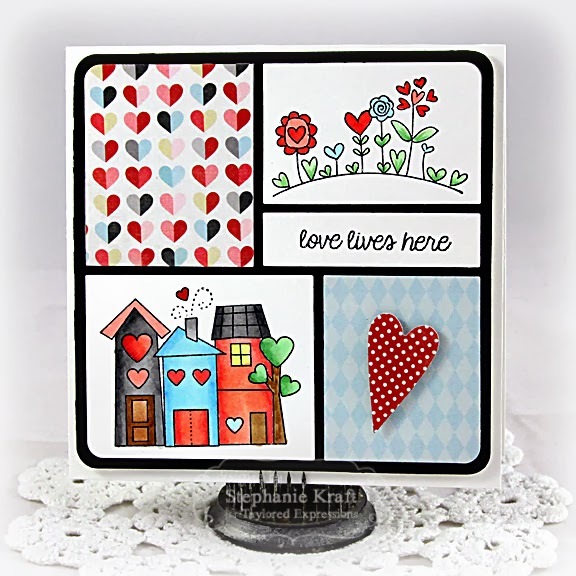 This one is the Square Block Cutting Plate, which is such a fun plate to create with! It also comes with 10 filler dies for the different openings (I used one - the heart in the bottom right block). I'm also using a new stamp set, Love Makes the World Go ‘Round. Thanks so much for stopping by! I'll be back tomorrow with more sneak peeks! Accessories: Taylored Dies: 3x4 Pocket – Part of My Heart, Heart Stacklets, Sweet & Simple Alpha Upper, Sweet & Simple Alpha #’s, P&P Essentials – 3x4 (TE); Wood veneer heart and camera (Studio Calico), Puffy heart sticker (Skipping5), Project Life Midnight Edition, Typewriter, Thread, Sewing machine. Accessories: Taylored Die: Square Block Cutting Plate (TE), Markers (Copic), Foam tape. ADORABLE page, Stephanie!! That card is so, so sweet! I just LOVE how you used the cutting plate! Love the card that say's Love Lives Here. Beautifully done. Hi Stephanie! 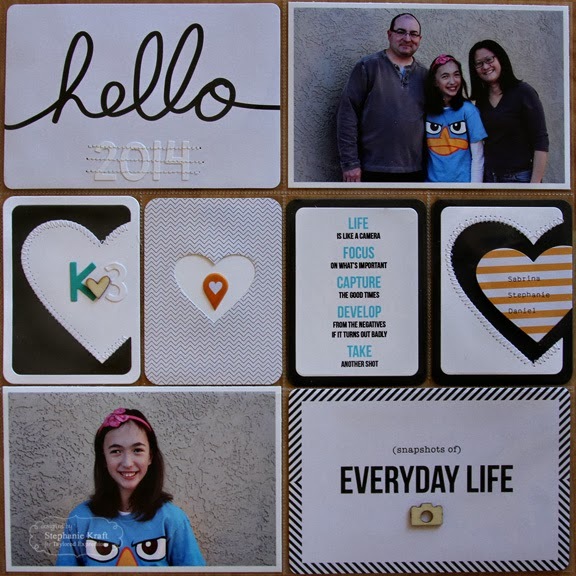 I always love your gorgeous scrapbook pages! SO much love and creativity in each detail. :-) See ya soon! What a fabulous scrapbook page, Stephanie....you have added so many creative and clever details!!! The little wood camera in the bottom pocket is sooo cute!!! 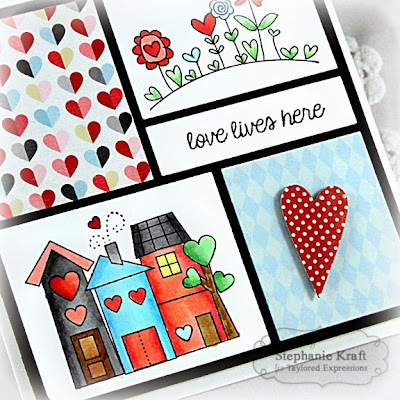 Love your fabulous card, too....such pretty coloring and amazing design details!!!! !